AZEK is a leading manufacturer of premium, low maintenance composite decks. Shouldn’t your deck perform as a great as it looks? With AZEK, it can. Unlike wood or traditional composite deck materials, AZEK materials do not contain any wood fibers. Instead, these deck boards are made with Procell® Technology, which means AZEK Deck is unlike any other deck board. Because of their unique construction, AZEK decks are resistant to stains and scratches. While the surface of wood and most composite decks can absorb liquids, AZEK deck materials are engineered to resist stains and even mold and mildew. AZEK Deck boards resist scratching and maintain their grain better than wood or composite boards. AZEK boards will not weather, warp, or rot, like wood either, yet these deck boards are workable like wood and 40% lighter than traditional composite. That’s what we call a win-win. Wood decks require annual maintenance: cleaning, sanding, staining, and repeat. AZEK composite decks, meanwhile, are low maintenance. These decks are designed to last without much effort on your part. According to to Remodeling Magazine’s 2015 Cost vs. Value report, composite decks carry an average return on investment (ROI) of 77% in Arnold, Maryland. Azek Decking Systems contain no harmful chemicals, making them an eco-friendly decking material. These deck boards are also termite resistant. 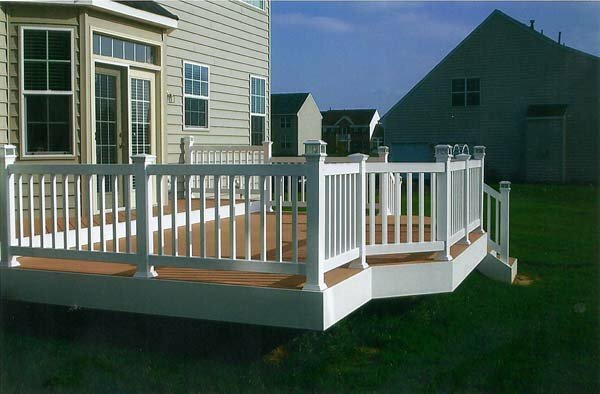 If you have any questions about AZEK Composite Decks in Arnold, please contact Freedom Fence and Home by calling 443-271-6841 or visit our website. You can also follow us on Facebook and Twitter! This entry was posted on Monday, March 16th, 2015	at 7:59 pm	. Both comments and pings are currently closed.